That's the real takeaway from the North Corridor portion of a presentation to the MTC given by CATS CEO John Lewis on Wednesday. No, the official recommendation doesn't officially pull the plug on the Red Line Regional Rail project that has been on life support for quite some time, but it doesn't take much imaginative thinking or tea leaf reading, and only the bare minimum of common sense, to see that is very likely the end result. 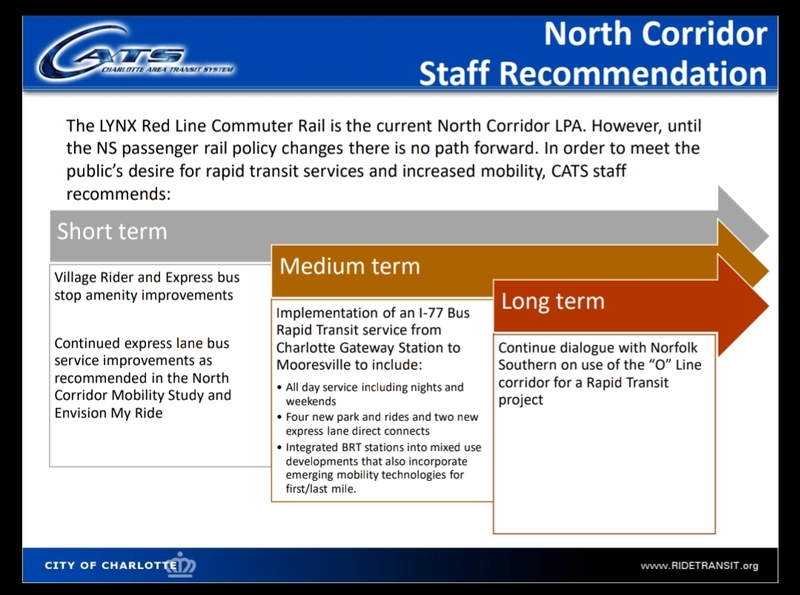 Based on the slides in the presentation, the Red Line Commuter Rail line to North Mecklenburg now looks to be replaced with Bus Rapid Transit - pending approval by the MTC. That's a good thing for tax payers, commuters, and the livability of the older parts of the North Meck towns. aShortChronicle has been writing about the problems with the Red Line train plan since the early days of this blog, so seeing sanity start to prevail on this subject is welcome relief. Readers can take a look at all of the North Corridor slides from the larger presentation at the bottom of this post, or see the link in this story on the meeting from WSOC. However, the gist of them is this. 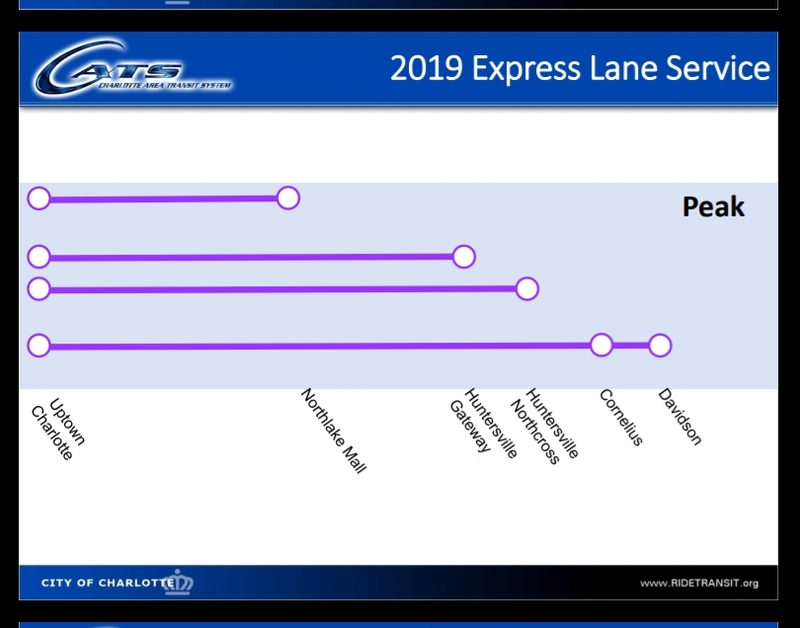 Enhanced Express Bus service will be on the way to North Mecklenburg as soon as the I77 Express lanes open. 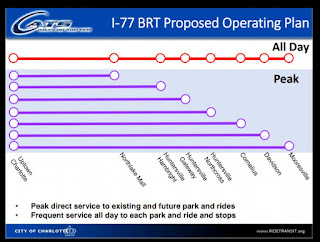 BRT will provide better service than Commuter Rail with direct peak service to an increased number of park and ride stops while also having all day service the full range of stops the rest of the day. Full BRT Service will be 5-10 years away assuming funding can be obtained. The Red Line train is now relegated to a long term (meaning likely never) plan. While the planners just couldn't bring themselves to officially recommend killing the Red Line rail project, keeping it on the books as a "long term" plan, with BRT in place it is hard to see rail transit ever getting built. BRT will provide faster, more frequent service while requiring significantly cheaper capital costs to implement. Once in place the argument for expensive, slow, and redundant rail transit effectively becomes silly. Frankly, that's a good thing. Rail transit along the Norfolk Southern O-line would destroy the small town character of the older parts of Huntersville and Cornelius, and be particularly bad for Davidson by encouraging stack and pack high density residential development in the immediate area of the proposed train stations. BRT along I77 on the other hand will be far enough from these areas to prevent this and some of the accompanying gentrification pressure while also providing a better mass transit solution. 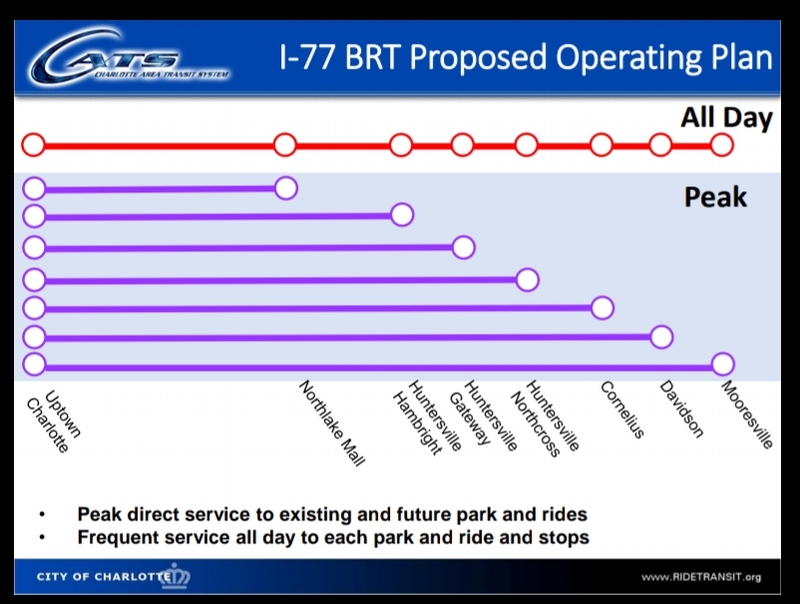 In contrast to Davidson Town Hall which has long been the biggest cheerleader of the rail transit in North Meck, former Mayor John Woods in particular became the face of rail transit, aShortChronicle has long been a proponent of BRT as the preferred solution. See, here, here, here, here and here. 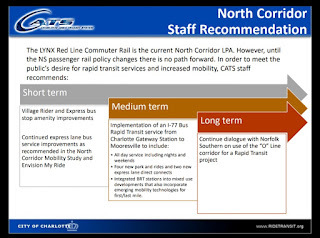 When the MTC does vote on this recommendation for BRT service, something that could happen as soon as next month, North Mecklenburg mayors who sit on that body should jump at the chance to vote for it.